A few days ago, I was interviewed for a nail art feature on one of the country's top television networks. It was 2 days after I came home from an out of town trip. They requested a demo for the Angry Birds nail art design I did last January. But due to a fever and unforeseen circumstances, I wasn't able to do the requested demo on my nails. When I recovered, I decided to recreate my Angry Birds nail design and I hope this post serves as an apology to the understanding and patient people of this television network. You see, I went down with a bad fever the night before the shoot. It was scheduled before lunch. I woke up really early that day and struggled to do my nails. I wanted to reschedule but I knew I would be creating a huge hassle on the organizers. After taking a quick shower, I realized I ruined most of my nails. Naturally, I didn't want a national television show capturing my nails looking unsatisfactory. I have always challenged myself to always come up with neat designs. This will NOT be an exemption. And so, I removed everything and started all over. This is me doing some nail designs on a lovely model for the feature. By the time the TV crew came, my nails were hardly ready. Luckily, they brought with them a model to whom I can demonstrate my nail designs to. It would be less time consuming that way since I find it harder to paint nail designs on my own nails compared to if I will be doing it to another. I was shaking a little as I wasn't used to being filmed while working. I was asked to create 5 different Halloween nail designs on one hand and 5 different Christmas nail art on the other hand. I included some of my favorite designs. Anyway, onto the nails! This is my second attempt to create an Angry Birds nail art design. The most distinctive difference are the outlines that I added to make the birds ... and the pigs more prominent. Also, I used nail polishes for painting the first one while I used acrylic paints on the latter. and the birds on the other. Base color is 2 coats of Orly Pure Porcelain. I freehand painted more pigs this time and eliminated the slingshot. I figured it would look more interesting to have more of those green pigs visible. Otherwise, our angry birds would not be able to have enough pigs to vent out their anger. 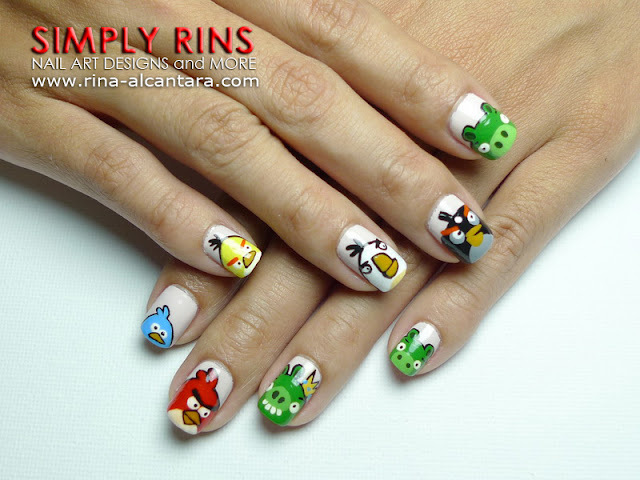 How did you like this second attempt of Angry Birds nail art compared to the previous one? I had most fun painting the pigs. I deliberately didn't include more details regarding the television feature of my nail art as I still need to receive information on the schedule of its airing. I will surely let all of you know when I get more details. For the meantime, I'd like to say thank you to all of you who keeps supporting my nail designs and to my family whose always behind my every endeavor. Keep us updated with the program airing! This design amazing. It looks great. I hope you are feeling better now!!! An accent nail of the red bird is a wonderful idea! That's my favorite Angry Bird! Would you consider having one of the green pigs as accent nail? Thank you! I just wanted to see if I improved as a nail artist from the previous Angry Birds nail art I did back in January. And I wanted to make up for not being able to demo it for the media crew. Wow!! U r so awesome with freehand!! Love these! Sooo cute :D I love the game and of course the mani! is there any chance that we could see your tv performance? wow when will it be aired? I love the green pigs too! Even though they are thieves! Haha! Hopefully the network will upload the feature online so I can show all of you how nervous I was during the shoot! I wish I could watch you... Sounds so cool! Love this nail art!! I'm from the Philippines, and would loooove to watch you on that show you were telling about. Unfortunately, I'm too late now. :( Is there any other way that we can watch that episode? Online perhaps? hi rins. very nice. ask ko lang what brush do u use? thanks! Hi, nails by kate vergara! aww that is so cute! So cuteee!!!! Do you have a nail salon that we could go to?